Visit CBU Library's One Book Nova Scotia page to learn about its choice for this year's read! 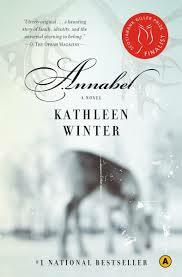 The critically acclaimed and international bestseller, Annabel has been the recipient of many tributes including being a Scotiabank Giller Prize finalist; Governor General's Literary Award finalist; and a Thomas Head Raddall Atlantic Fiction Award winner. Several copies of Annabel are available for loan at the Cape Breton University Library (in the first floor Atrium) and the Cape Breton Regional Library.